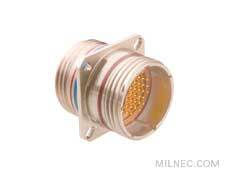 This connector has receptacles on both sides of the shell, allowing D38999 cable plugs to connect from each side. The pins and sockets can be arranged on either side to meet your design requirements. A mounting bracket and gasket are recommended.